If you store fresh mushrooms correctly, they'll stay good for up to a week. It's easy. Here's how. 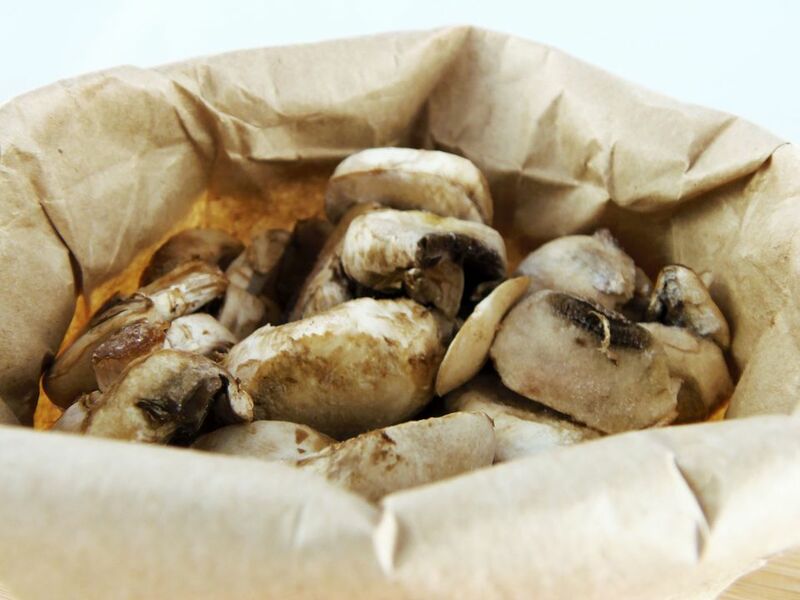 Place whole, unwashed mushrooms in a brown paper bag and fold the top of the bag over. Then stick the bag in the main compartment of your refrigerator. This works because the bag absorbs excess moisture from the mushrooms so they don't get soggy or moldy. Do not store mushrooms in the crisper drawer—it's too moist an environment. Avoid placing mushrooms near foods with strong odors or flavors because they'll absorb them like a sponge. Take care not to stack other foods on top of them. Squished, bruised mushrooms don’t look very appetizing, and they won’t keep very long. Some mushrooms hold up better in the fridge than others. To avoid waste, try to buy your mushrooms close to when you plan to use them. If you need to store mushrooms for more than a week, consider freezing or drying them. Mushrooms freeze well, but it's best to get them in the freezer as soon as you can. Don't wait for your mushrooms to start deteriorating in the fridge before you decide to freeze some. If you have a large mushroom haul, be deliberate about setting some aside for eating right away and others for eating later. Try to be realistic about how many you'll eat in the next week so you can freeze the rest before they go bad. Mushrooms need to be cooked before they're frozen. This will stop the enzyme action, thereby preserving their quality, so it's important not to skip this step. If you don't have a lot of freezer space to dedicate to mushrooms, drying them is another option. Dried mushrooms can be rehydrated as needed, and they take up very little space in the pantry in the meantime. Use a low-temp oven or a food dehydrator to dry your mushrooms. Then keep them in an air-tight container until you need them. If you've never dried mushrooms before, try a small batch and see what you think. Once you learn how to reconstitute them, you might find that they're every bit as good as fresh mushrooms. If nothing else, it's great to have dried mushrooms on hand to toss into homemade soups. If you aren't sure what do with your mushrooms before they go bad, here are some ideas. Toss them in pasta, use them to top a pizza, add them to soup, or saute them in butter and pile them high on burgers. Sauteed mushrooms are also a tasty side to steak. Just flip through your recipe collection, and you’re sure to find lots of recipes that would taste even better with a handful of mushrooms thrown in.